Transportation committee leaders criticize a decision to vote on key elements of the Southwest Corridor project without further study. Warning that the future of the metro area’s biggest light-rail project is at stake, key legislators Thursday urged the agency in charge to look for new ways to route freight rail traffic out of Minneapolis to make way for the transit line and mollify critics. 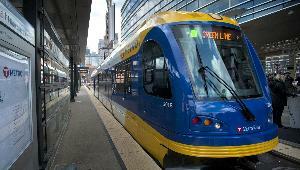 State Sen. Scott Dibble and Rep. Frank Hornstein, DFLers from Minneapolis who lead the Legislature’s transportation finance committees, said the decision this week by Metropolitan Council Chairwoman Susan Haigh to end a search for alternative routes “will result in significant delays and may very seriously imperil” the Southwest Corridor light-rail project. They urged Haigh to postpone critical votes scheduled in the next two weeks so that other options for dealing with the freight trains can be more fully explored. “No decision should be made until the questions are answered and these issues are resolved,” they said in a letter to Haigh. But Haigh said in a statement Thursday that she believed a reroute already under consideration was the best alternative to keeping the freight trains in Minneapolis and putting the LRT line in tunnels next to it. That reroute would put freight traffic on two-story berms in St. Louis Park, an option strongly opposed by some residents in that city. The letter revealed an unusually public rift between DFLers over the direction of a light-rail project that has escalated in costs as planners attempt to satisfy critics upset that freight traffic will either remain next to the future LRT in the Kenilworth corridor of Minneapolis or be rerouted to St. Louis Park. Haigh decided Wednesday to end the search for a different route after a consultant with ties to the freight railroad industry refused to analyze other options, citing a conflict of interest. Dibble and Hornstein sharply criticized her decision. Hornstein, in an interview, said he, Dibble, Gov. Mark Dayton and Haigh met in August and agreed that further exploration of reroute possibilities was needed. Minneapolis officials are concerned that strong opposition to the reroute option in St. Louis Park will result in freight and LRT trains running in Kenilworth against community wishes. Bob Hume, Dayton’s chief of staff, said Thursday that the governor would be reviewing the letter. Haigh has pushed to vote soon on the project so that key elements are approved in time for additional funding next year by the Legislature. But Hornstein said failure to solve the freight problem could jeopardize chances of the project being approved by Minneapolis or St. Louis Park. The Met Council must seek consent from cities along the proposed route from Minneapolis to Eden Prairie. If a city withholds consent, it can further delay or jeopardize the project. Meanwhile Thursday, about 50 people opposed to keeping freight traffic alongside recreational trails and the future LRT in Kenilworth attended a fundraiser at the home of retired advertising executive Lee Lynch to finance a possible lawsuit. Lynch, who lives near the future LRT line, said he expected to raise $30,000 from attendees, doubling funds raised so far. Former Hennepin County Attorney Tom Johnson was expected to address the gathering about political and legal strategies for fighting options to put the LRT in two tunnels near the freight in the Kenilworth corridor or at ground level next to the freight trains, a possibility that hasn’t been ruled out. This entry was posted in Southwest LRT on September 28, 2013 by citoyen1789.